I've had the chance to visit. In late July of 2002 Kerri and I enjoyed the Music City Brewers Festival in Nashville, TN and then drove up to Louisville, Kentucky to visit the brewpubs there and see Churchill Downs. Louisville is definitely a good travel destination for beer fans because it has some incredible package stores (Liquor Barn and Party Mart) and bars where one can purchase world-class, high alcohol beers -- but the three brewpubs we found really made the trip worthwhile. Read on for information about each brewpub, and be sure to drop me an email to let me know your opinions. 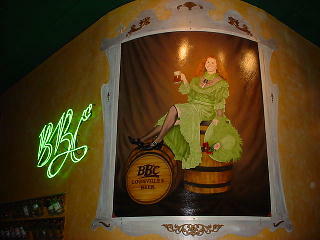 Bluegrass Brewing Company, 3929 Shelbyville Rd, Louisville, KY. ph: 502-899-7070. Bluegrass is an extremely pleasant brewpub with delicious pizzas and other entrees. There is live Bluegrass music on occasion and some exceptional brews. There was a Pale Ale, Alt, Porter, Wheat, Nut Brown Ale, Scottish Ale, Belgian White, and Belgian Strong Ale on tap when we visited. 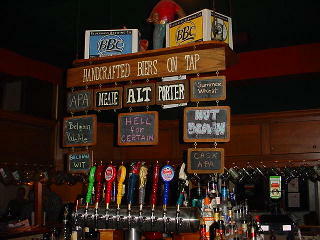 Our favorite was the "Hell for Certain" Belgian Strong Ale because of its complex, rich, spicy character. If you ever find a bottle of BBC's Barleywine, be sure to try one -- it is really powerful, malty, and potent! 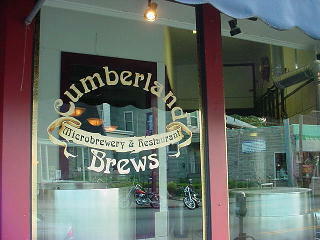 Cumberland Brews, 1576 Bardstown Rd., Louisville, KY. ph: 502-458-8727. Patrick Allgeier is the general manager and "professional beer drinker" at the tiny Cumberland brewpub. This comfortable, homey, neighborhood pub is very appealing. All the food is very tasty, fresh, and made on premises -- and the beers are outstanding. The Hefeweizen, Brown Ale, Porter, and all other beers are made with care and love in the small two barrel brew house. 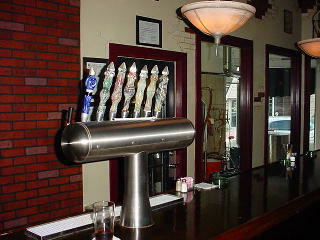 Cumberland is remodeling their upstairs at the pub to offer a quaint tasting room and private bar. 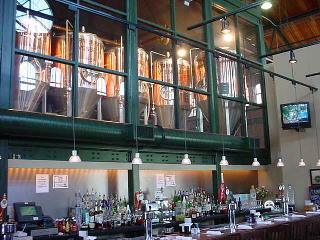 Browning's Brewery, 401 E. Main Street at Slugger Field, Louisville, KY. ph: 502-515-0174. 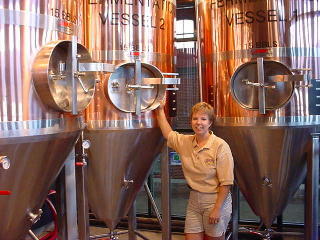 Eileen Martin (above left) is the brewster at this new brewpub in downtown Louisville. Eileen (or "Ale-Leen" as she refers to herself) is one of the few female brewmasters in the United States, and she has done a terrific job with the beers at Browning's. 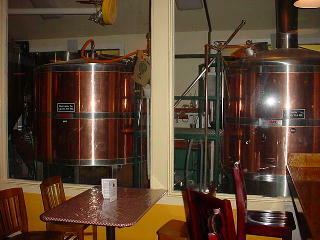 This brewpub was opened in April of 2002 and starting brewing on May 2. Their beers include a Blonde Ale, Red Ale, Oatmeal Stout, ESB, Cream Ale, and a Seasonal -- all of which are clean, flavorful and true to style. The menu has burgers, sandwiches, pizzas, pastas, steaks, and fish. During baseball season, one can have food and beer at Browning's and then walk out the back door into Slugger Field to catch a Louisville RiverBats game (the RiverBats are a farm club of the Cincinnati Reds).